Doctors: A Money Making Career? "Are you going to become a doctor to earn money? If you do, then it is the right time to quit now"
That was what my lecturer in Medical school always said to us. We are not getting into this job for good money. We want to serve the community, to help the ill, to make world a better place. We were trained to have this kind of mentality. Until we grew up and become a doctor ourselves to realise that the bitterness of that statement is really hurtful to ourselves, our family and perhaps our future. Is it true that this career is not a money making career? Partly true. A resident doctor in US would earn USD 50000 to USD 60000 a year. That's equivalent to RM177280 - RM212736 in Malaysian currency. However in Malaysia, a medical officer will only be paid RM40000-RM50000 a year. The discrepancy is so larger. We can't compare with them, they said. Our country is in a big money problem today. Family or Money: An opinion. Which one is more important? Family or Money. Some random colleague ask me this question at work. Perhaps 10 years ago, it would be so easy to answer such question. Today, it was one of the question that would produce a lot of controversial answers. Everyone will have their own opinion on this matter. A family is an important thing because without your family, your child, your wife, life would be meaningless. This is the driven force for you to wake up everyday and work hard to improve yourself. Watching them happy will make you happy. They are the one who will be with you no matter you are up or you are down below. Some even say that your family can be the one who will accompany you there in the afterlife. You have a lot of sin, in hell you will be with them, you a a good person then you will be in heaven with them. A smile on my daughter's face is enough heaven for me. Desa Dairy Farm Kundasang: Never stop to please me. 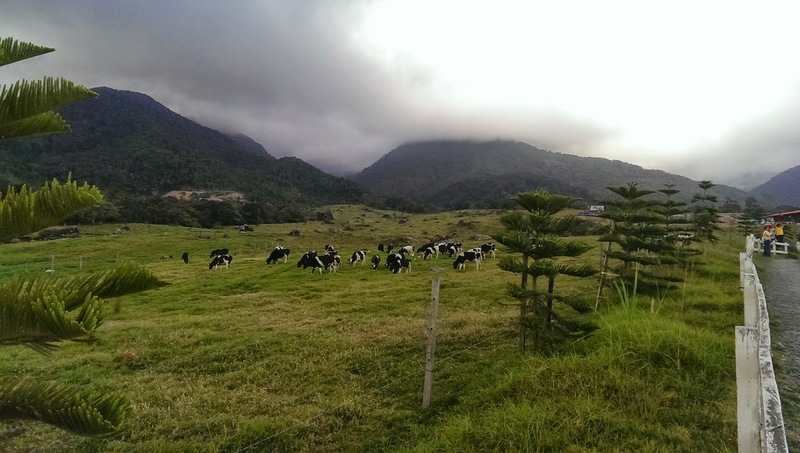 One thing that I love when visiting Kundasang is to visit the Desa Cattle farm. People would suggest to me to go to Poring Hot Spring, or Tagal Fish Massage, but only Desa cattle farm that attract me that much. That is why for I do not know how many times already, I brought my wife, daughter and my parents to visit this place. I can't stop loving this place, despite the smell of cow's dung, the rest of it is heavenly. The view was so relaxing it make me forget everything about work. It is good place to run away from your daily job stress. GST: A tax that is good for Rakyat? So it is almost 2 weeks after GST was implemented in Malaysia. What is its effect? Everyone has their own hypothesis on what will happen after 1st April when the GST started. After 2 weeks, what I, as a citizen, saw about it? Well, the price of everything went up. No matter how many people were order to convince that GST will not cause price increase, it still went up. It is just logic. Example, prepaid reload card that make everyone loses their mind. Before this it was taxed 6% and after that the tax was abolished and replace with 6% GST. Normal low IQ people will think that price will not change. We do not have lower IQ in Malaysia, we are clever. Price goes up 6%. Why? Go figure it out. I've been transferred to Pathology Department HQE upon my request. The reason.. I love Microbiology then why not give a shot into Pathology Department, from here I hope that I can find my way through to the field that I like. Life is a bit different now. Living in apartment, stuck in traffic jam everyday when going to work and when getting back home from work. I am still in adjustment period. Otherwise, work now 8am-5pm. Not like in district hospital... working like almost 24 hours, more than that. Every workplace has their own stress. In Sipitang, I am stress that I am working like every hours every day. Here in my new place, I am stress with the workload, the work field that is so different from what I have been trained before. No more clinical, now I am working behind the scene.